What a great week we had at Children’s House! In Practical Life we put out some new food works that the student’s couldn’t get their hands on fast enough! First was the trail mix work where the students counted out ten of three different items and then mixed them together and enjoyed! This will be fun to change out the food and keep it interesting for the children. We also put out cinnamon toast work which isolates the skills of cutting, spreading and pinching cinnamon with their pincer grip, the way they hold a pencil. 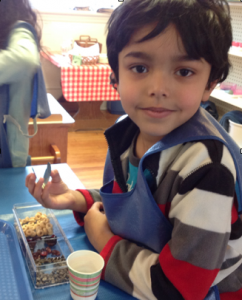 One of my favorite aspects of our classroom will always be watching the children serve the food to their friends. It’s such a great opportunity to promote kindness, sharing, and peer interaction. The students are working through the curriculum as we guide them towards new lessons. The children will repeat lessons or work choices until they have reached mastery. In many cases they cannot move forward if certain skills are not mastered such as number and letter recognition in math and language. If you see your child bringing home the same or similar works over and over, understand that this is part of the process towards mastering the lesson. We will continue to follow the child and challenge them to try new lessons as they become successful. Thank you so much for trusting us to provide the very best for your children.